Это самый дорогой проектор из всех производимых фирмой Dell. Презентации можете делать при полном дневном свете. Мощная яркость лампы будет все четко отображать на любой поверхности и при любом освещении! 100% новый. Ни разу не включался. What is DLPTM DDR Technology? DLP DDR technology is based on a unique semiconductor known as the Digital Micromirror Device, or DMD. It was invented by Texas Instruments in 1987. The DMD is a fast, reflective digital light switch. !It can be combined with image processing, memory, a light source and optics to form a DLP system capable of projecting large, bright, seamless, high-contrast color images with unmatched color fidelity and consistency. The Dell 5100MP incorporates the latest generation of DLP DDR technology which now features a 12 degree mirror tilt for higher brightness, a new manufacturing process to deliver superior contrast and DDR memory for even better video reproduction. What is Advanced Exchange Service? If your Dell 5100MP Projector or part requires replacement due to a problem covered by the Dell limited warranty, the Advanced Exchange Service program helps you get up and running as soon as possible! 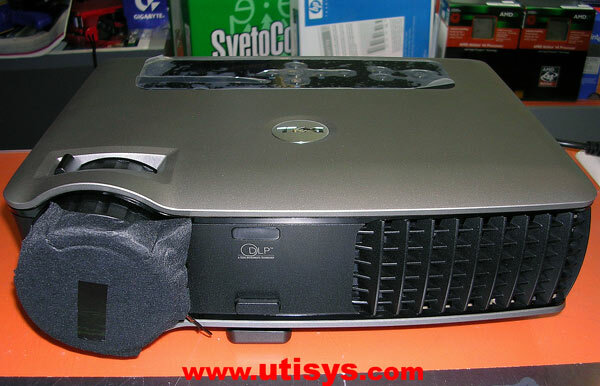 If after telephone troubleshooting with Dell Technical Support, it is determined that your projector has a problem requiring replacement and your call was placed before 5PM local time, you will be shipped a replacement system or part in most cases by the next business day. You can ship the defective unit back to Dell in the packaging provided, so you can be up and running for your next presentation in no time. This service is included as a standard offering for the duration of the warranty period.